- each and every time trying to find engineering solutions for scratch building scenery components in a semi-industrial way. Overall view of the Odessa module. On the one hand this module includes quite a lot of "special projects" such as the laser cut designed buildings, operating street lights, cast pavement and sidewalk. On the other hand, the family grew by one in March 2005, which brought productivity downwards quite a bit since then…. During the first twelve months (mid 2004 / mid 2005), I designed and built 3 out of the 4 main structures of the diorama. 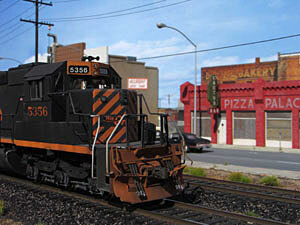 During the third batch of twelve months (mid 2006 / mid 2007) I designed and built the operating street lights, the photographic backdrop (also presented in those web pages), and I took care of two recent entries into my roster (2 gorgeous SD40-T2 tunnel motors, one SP version and one Rio Grande version) which I super detailed, painted and weathered (those are featured in many of the accompanying pictures). The final period of twelve months was dedicated to adding the finishing touches to the whole display, design and building of the utility lines, traffic lights, structure's interiors, street vehicles' detailing and weathering, and last but not least wiring of the module for train and lighting effects operations. Hence, the display includes quite a lot of fully scratch built complex parts which prevent me from sleeping from time to time, but which also provided me with great pleasure in creating. - Street traffic lights (non-operating) created with drinking straws! - A custom photo montage created with Photoshop and some of my own pictures as a backdrop. Each of those sub-projects could be worth an article on its own. On those web pages, one can tap into creating a custom backdrop. 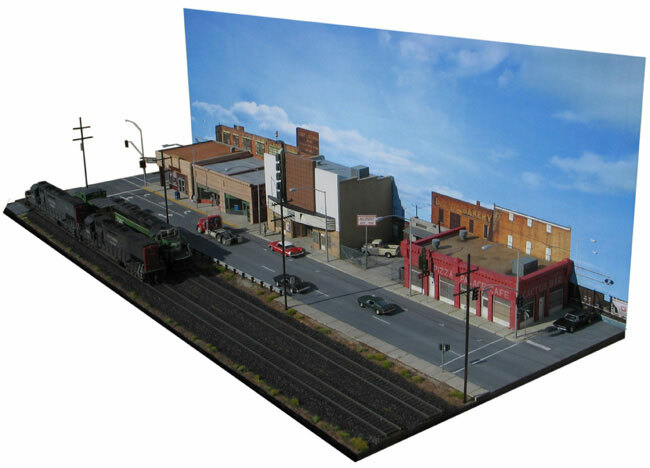 In a recent Model Railroader article (How to design realistic urban scenery April 2008) one can also gain better understanding at how to create cast Hydrocal pavement and sidewalks for prototype appearance. Should time permit, I'll add some more "How to" articles in the near future, to share some of those quite rewarding techniques. A few fellows have helped me and supported me over the past four years in creating this new display and I would like to thank them. One of them is Jean Luc Collard, a French fellow modeler (although he is still dealing with HO scale) who supported the entire project with ideas and suggestions. He is also the one who helped in creating the Photoshop custom backdrop. Another one is Jean Yves Quéré, another French fellow modeler, animating the French Proto87 modelling club, who provided me with contacts and advice for creating master models and having them cast by the right contractor. Finally, Philippe Guiffard kindly lent his glass beading unit for preparing brass models. On top of this, a couple of friendly U.S. hobby shops have supported me over the years managing to provide the source for various scratch-building supplies: Stan of Coronado Scale Models of Phoenix AZ and Ron Sebastian of DesPlaines Hobby ILL.
Last but not least, my wife Caroline and my daughter Mathilde who have shown great patience and understanding during all those years.